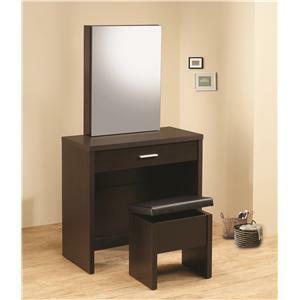 This sleek contemporary vanity set will be a welcome addition to your master bedroom or dressing area. 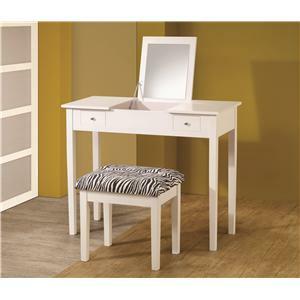 The vanity has a generously sized table top for all of your essentials, with two small drawers for frequently used items like make-up and hair care products. A beveled edge mirror flips up in the center, adding depth and light to your room, while helping you get ready for your day. 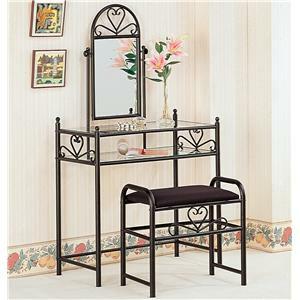 Square tapered legs support the piece, all in a deep Cappuccino finish, accented with simple silver tone metal knobs. The matching stool has the same slick tapered legs, with a soft neutral fabric covered seat for comfort and elegance. 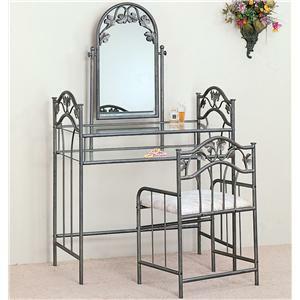 Place this vanity set in your bedroom for a quick style update, and a huge dose of functionality. 40"W x 19"D x 30". 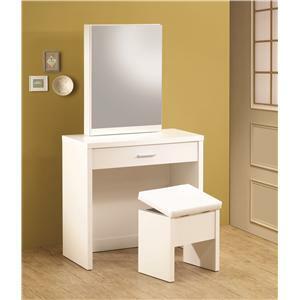 With mirror 44"H.
The Vanities Contemporary Flip Top Vanity and Stool with Fabric Seat by Coaster at Value City Furniture in the New Jersey, NJ, Staten Island, Hoboken area. Product availability may vary. Contact us for the most current availability on this product. Storage Two small felt lined drawers. 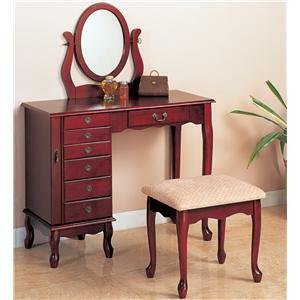 This group offers a variety of stylish vanities to complement your taste. 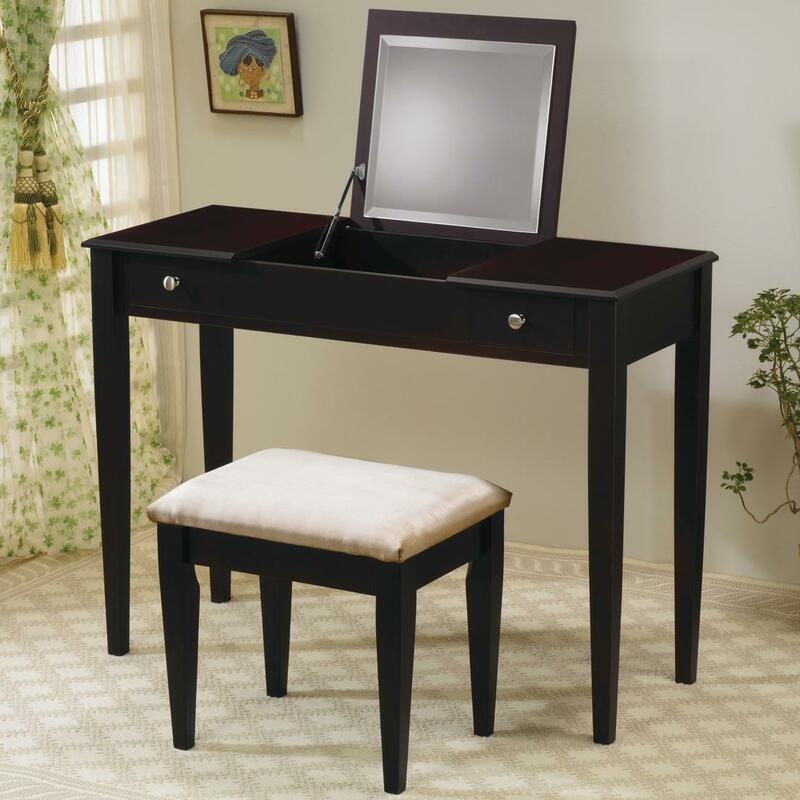 Constructed of both metal and wood, with many different styles and finishes available, you are sure to find the perfect vanity to meet your needs. 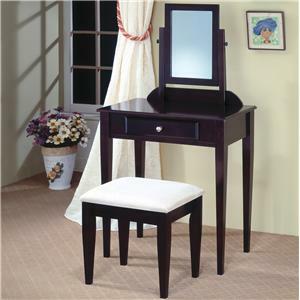 Convenient storage options, attached mirrors, and matching stools are some of the great functional features of these gorgeous vanities. Choose the perfect piece for your home, to create a relaxing and warm spot to prepare for your day. 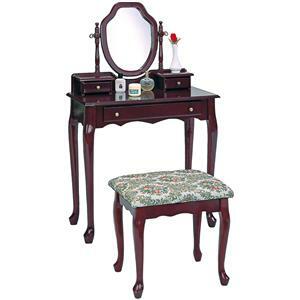 The Vanities collection is a great option if you are looking for furniture in the New Jersey, NJ, Staten Island, Hoboken area. 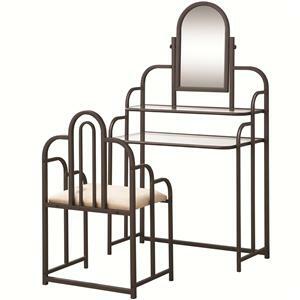 Browse other items in the Vanities collection from Value City Furniture in the New Jersey, NJ, Staten Island, Hoboken area.